Like it or not, supermarkets play a big part in what most of us drink. In an ideal world, I would only ever buy from independent wine merchants, both bricks-and-mortar and online. But sometimes what you have in the house doesn’t go with what you are cooking or, indeed, what you feel like drinking. And, in a town or city, there is always a supermarket nearby (and there may not be a decent wine merchant at all). It’s easy to castigate the supermarkets for making the British consumer value cost above quality and for “internationalising” tastes, whereby people expect wine from a certain grape to taste a certain way year after year, irrespective of where the grapes were grown and the wine made. Think of all those people who say “I don’t like Chardonnay” because they think it has be rich and heavily oaked. On the other hand, I think Marks & Spencer and Waitrose have done a lot to introduce consumers to new wines and regions and encourage them to spend a little more on a bottle of the usual suspects. I’d be lying if I said I never got any joy from perusing the shelves of both these supermarkets to see what’s new and interesting. Both are now stocking English wines, for example. I think Chapel Down’s grapefruit and minerals Flint Dry 2009, which I bought from Waitrose, gives mid-priced Chablis and Sancerre a run for their money. 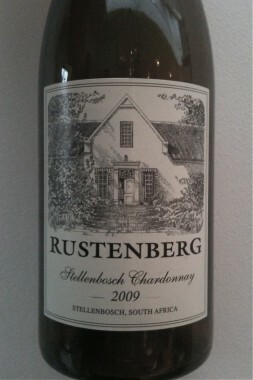 I also liked the Cote D’Or-style Rustenberg Chardonnay 2009 from Stellenbosch in South Africa. It’s creamy yet refreshing, with round flavours of apricots, almonds and vanilla. The oak complements rather than competes with the fruit. At about £12 a bottle, I think the Rustenberg Chardonnay is good value, especially when you compare it to the Errazuriz Wild Ferment Chardonnay 2009 Mr. SipSwoosh picked up at the Co-Op for just under £10. The nose had lots going on with aromas of pears, melon, butter and some toast. But on the palate it tasted aggressively oaked, knocking the sprightly fruit and butter flavours into second touch. It was much better the next day, when the oak had integrated better with the other flavours and you could appreciate its long finish. But it’s not a patch on the Rustenberg. I also think Waitrose own brand Cava Brut NV is a bit of a steal at under £7 and served their elegant Waitrose Special Reserve Brut 2002 Champagne at Christmas (which was discounted at around £22, but I would happily pay full price). Not that everything I buy from Waitrose is a success. I was disappointed with the 2009 Cono Sur Pinot Noir because the first thing I smelt was alcohol, which is never a good thing. After that, there were some faint aromas of strawberries, roses and boiled sweets. Not unpleasant but not enticing either. The palate was ok, red cherries, spice, some bitter smokiness but the next day, the fruit flavours had faded rapidly. This is a wine that is often discounted, but I paid £7.99 and I don’t think it was worth it. I also tried a Blason de Bourgogne 2008 Saint-Véran which tasted flat, like golden delicious apples which had withered in the fruit bowl. I tried another bottle just to make sure it wasn’t off. It wasn’t. It was just past it. This retails for around £10. Regular favourites from M&S include its soft, perfumed 2009 Tasmanian Pinot Noir, Prosecco Zardetto NV – one of the few decent ones youcan buy without going to an Italian specialist – and Chapel Down English Sparkling Rosé Brut, made especially for the store. 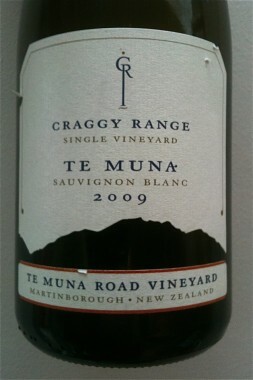 I was also very pleased to find Craggy Range’s Te Muna Sauvignon Blanc 2009. Nine-months in oak barrels (M&S bottle label) and four months on the lees (Craggy Range’s tasting notes) gives this elegant, restrained lime, blackcurrant leaf and elderflower-tasting wine a lovely depth and finish – a world-away from the cheap NZ Savs that hog the supermarket shelves. A couple of months earlier I tasted the 2008 vintage at Craggy Range itself. Despite being a year older, the fruit was more prominent – primarily freshly-picked blackcurrants. I could taste thyme as well. This wine spent a month less on the lees and, while it is probably a more characteristic Sauvignon Blanc from Martinborough, I slightly preferred the 2009. Finally Tesco. I pass one when I walk to the gym and often peruse the wine shelf on the way back, just in case I see something new and different. I certainly did the last time I went. 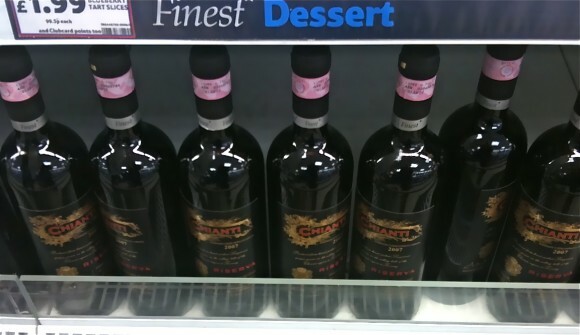 Bottles of their Finest Chianti Riserva 2007 in the chiller cabinet next to some desserts. The Chianti was there because it was part of a meal deal (I did ask). Now, there are some light, fruity wines that should be served lightly chilled. Chianti isn’t one of them, especially a riserva, which means it’s been aged for a length of time, probably in oak. While short-term storage in the chiller cabinet may not do it enormous harm – so long as you warm it gently to room temperature before serving – would you buy a £7.99 wine from a shop that does this?